A loan of $8,000 helped to buy materials for bead-making in new and popular colors, fulfill larger orders, and create jobs for local people in Ghana. 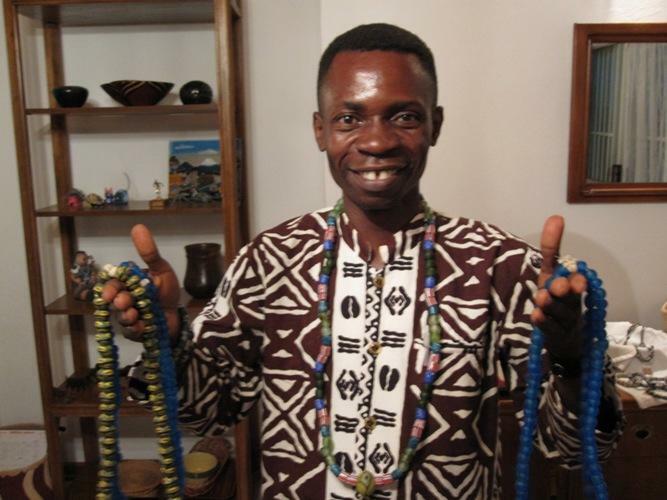 Cedi was born into a family of Ghanaian bead-makers. When he was 7 years old, he began hiding from his parents to design glass beads at home. Today, Cedi continues to demonstrate passion and dedication to traditional recycled glass bead-making. In Ghana, beads play a major role in everyday life; Cedi’s family comes from the Krobo traditional area, one of the most well-known bead-making areas in Africa. Cedi’s techniques are featured in numerous books, magazines, and videos. He hopes to expand his business, sharing his work with retailers around the world, and creating more jobs for people in local communities in Ghana. A loan of $8,000 will help Cedi buy raw materials for his beaded pieces, especially materials that are not common in his region. He will be able to purchase glass in unusual colors, including turquoise, blue, and purple, that drive sales and increase incomes for his employees.